KB Recruitment are an independent specialist recruitment agency, specialising in the Estate Agency, Property, Financial Services and Legal and Conveyancing sectors. They operate predominantly but not exclusively, throughout the South and South West. 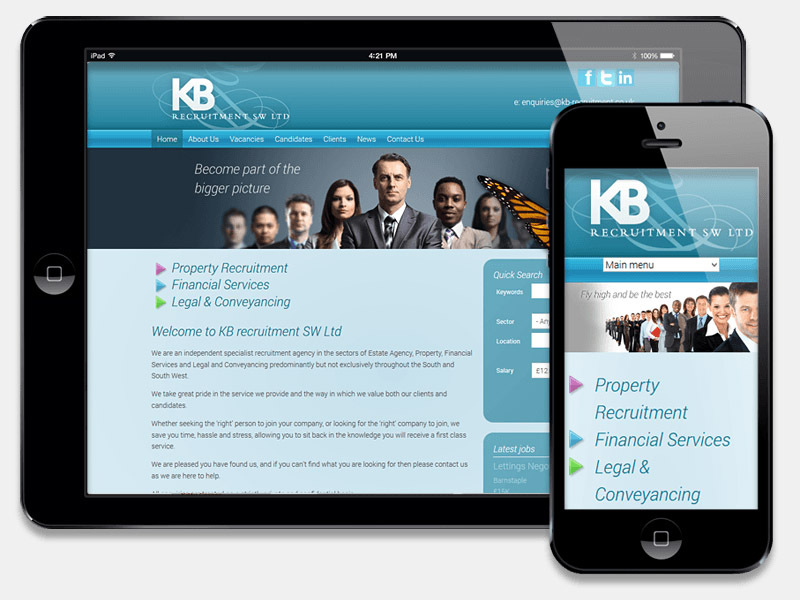 KB came to us requiring a new website that would promote their services and allow administrative control of their online vacancies database. The site needed to adhere to, and improve upon their existing branding whilst conveying a professional air. The new website now imports jobs automatically every morning, using RSS from an external database. New jobs are announced on social media minutes after the import. Users can apply for the vacancies directly on the site using a simple form. This is an example of how a content management system (CMS) can be fully adapted to our customer's needs, in this case, developing a custom plugin to populate the website from external sources, making the website totally independent! The team at Website Development Ltd designed and built our website within budget and on time, producing exactly the end result we were looking for. Working with them continues to be a pleasure, and they are always extremely professional, technically outstanding, and respond promptly to any queries. You deal with real people not 'menu systems’, when contacting them and most importantly they 'listen' to your requirements. A refreshingly honest, first class and friendly company to do business with.